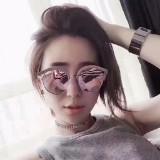 Jimmy choo New Women's Sunglasses Swarovski Flash Diamond Skin. Details: Frames/Materials: Complex Metal Frames and Swarovski Flash Diamond Skin Lens: Polycarbonate lens, hard-coated, 100% UV400 protection. Lens technology: Grade 2 green mirror CR-39 scratch/impact resistant lens. Dior Style Model/Color Code: 5 colors to choose from Size Eye/Temple/Bridge:50-22-145, Packaging: with original limited edition box, cleaning cloth Gender: Ms Shipping: free Shipping! Global Free Shipping! Shipped from China We usually ship within 1-5 working days after receiving the settlement payment. The item will only be sent to the buyer's shipping address, so please confirm your available address before making payment. Sometimes, international express delivery depends to a large extent on delivery companies and local customs/tariffs. If you do not receive your product in time, please contact us immediately for further assistance. Thank you for your understanding. We usually choose DHL or FedEx Logistics Processing time Ship to Australia: 3-10 days. Ship to the United States: 5-15 days. Delivered to Europe: 10-15 days. Leaving Asia: 3-10 days. Ship to other places: 3-10 days Include tracking number. Note: Any delay in customs fees, taxes or VAT or national regulations will be the buyer's responsibility. Refund policy The consignee will accept the return within 14 days after receiving the goods. (Does not include personal injury or misuse). 100% Money Back Guarantee! All shipping costs for returned products are paid by the buyer (please purchase rationally!). Please contact our return address. contact us If you have any questions, please feel free to contact us via "Ask seller questions". Due to the large number of e-mails and time zone differences each day, we will try to reply to your e-mails, but we may not be able to respond to your e-mails immediately. Please allow us 1-2 business days to reply. Feedback Your feedback is very important to us. Positive feedback is very grateful. Please give us an opportunity to solve any problem and we will try our best to meet your needs. Please note: We hope you are satisfied with your purchase! We are very happy to accept the return of any reason. Import duties, taxes and customs fees are not included in the freight charges and are the responsibility of the buyer. Please study before buying. Our digital image may have the most accurate color. However, due to differences in computer monitors, we cannot be responsible for the color change between the actual product and the screen.